Guitar music certainly isn’t dead, as Dead! prove in their explosively charged debut album. It’s been a long-awaited album, not just for the band’s fans (of which I definitely count myself amongst the ranks of, and even more so after the release of their first full-length record) but for the band themselves as well. By all accounts it’s not been the easiest road for the band – in the announcement for their debut, they list ‘two guitarists, five drummers, four broken bones, two crushed wrists, a van wiped out by a truck’ as things they got through to reach the point they’re currently at, but they’ve shown themselves to be the epitome of what DIY is about, and produced an absolutely incredible debut record. I first discovered Dead! when they were the support band for Blondie’s gig at the Roundhouse last year, and I instantly loved their music – it was exciting and something I knew I wanted to listen more to, and I’ve been waiting (not very) patiently for their debut album ever since, and it certainly did not disappoint. It’s punk, but it’s not just punk – there’s straight-up rock at times, riffs that resemble the best of ‘90s grunge, and even an almost indie feel in the case of the track ‘Jessica’. It’s a perfectly imperfect mix of styles, and ambitious though it might be, it certainly pays off and culminates in the band’s distinct sound, and what is already one of my favourite albums of 2018, even though we’re a mere 28 days into the year at the time of writing. It’s difficult to pick the standout songs of the album, when every single track is as good or better than the next – the band self-released a number of singles before the album, and in all reality they could have released track from their debut album as a single because they genuinely are all that good. ‘Enough, Enough, Enough’ is definitely one of my favourites, with its heavy, driving riffs, as is ‘You’re So Cheap’, a song which although it starts off comparatively slower than a number of tracks on the album, ends up becoming something you instantly want to head-bang to. ‘A Conversation With Concrete’ also stands out and is one of my favourite tracks, which is a definite compliment when considering every song is a standout. 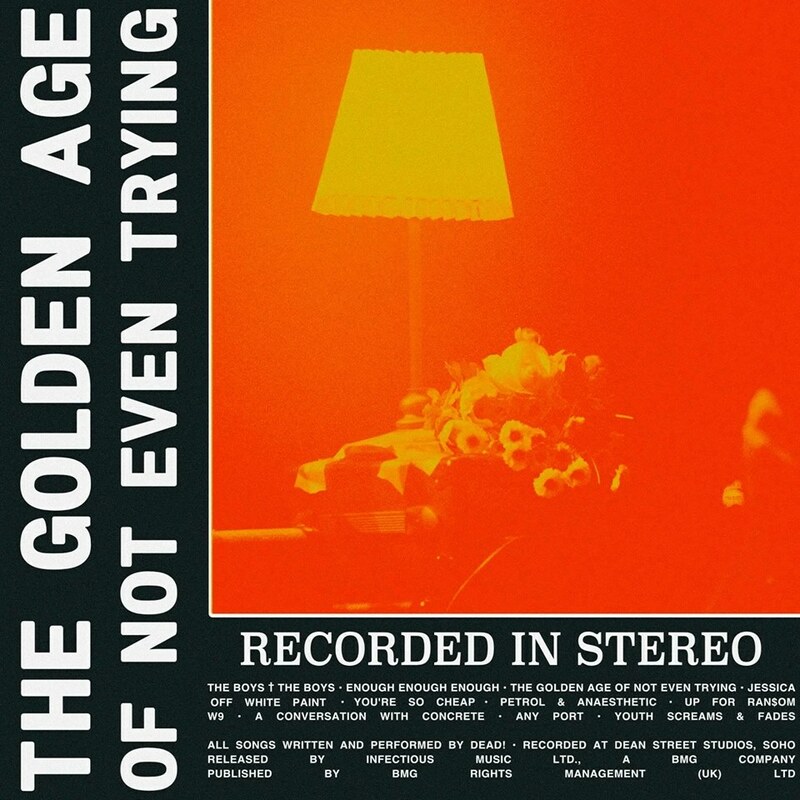 The Golden Age of Not Even Trying is a superb debut album, and if it’s anything to go by, then Dead! have big things ahead of them. Dead! play the 100 Club in London on the 1st February, tickets available from https://www.theinternetisdead.co.uk/tour.